For almost 200 years, The United Methodist Church has operated hospitals and clinics throughout Africa. These facilities are a vital and trusted part of the healthcare delivery system on the continent. We are in many hard-to-reach places, beyond the reach of many aid organizations, sometimes even governments. Now, United Methodists from all over the world are joing the effort to prevent, treat, and ultimately eradicate malaria. New England United Methodists have taken up this cause, and here are some of the stories of the creative ways our churches are participating in the Imagine No Malaria campaign. In April 2014, Holbrook UMC in Holbrook, MA started a collection jar for Imagine No Malaria. They have placed a large empty water jug in the foyer and ask congregants and visitors to donate any amount of money to the INM campaign. This is separate from the INM offering normally collected during services. Holbrook UMC pledges to save at least 50 lives for INM in 2014. Rev. Hyuk Seonwoo from Zion KUMC joined the 5K walks/runs two times during the 2012 and 2013 New England Annual Conferences. On the following Sundays, he led worship services wearing the INM t-shirts, and invited worshippers to pray for the INM campaign. Since the 2013 Annual Conference, Zion members have been consistently invited to pray for and participate in the INM campaign. Every Sunday, Imagine No Malaria is introduced on the worship bulletin and projected onto the screen with PowerPoint slides. The United Methodist resources for Imagine No Malaria, which include Korean resources, have been immensely helpful. Zion KUMC also participated in the UMC #GivingTuesday on December 3, 2013. It was a great opportunity to build awareness and support for the INM campaign. Enfield, Connecticut UMC's Birthday Party Bugged! Family and friends reveled and swatted with joy last month in support of Imagine No Malaria. Partyers dressed as mosquitos and helped raise funds for Imagine No Malaria. Enfield UMC raised over $1,000 for Imagine No Malaria in a single day. Think of what your church could do! Children at Bradley Memorial UMC in Fryeburg Harbor, Maine squashed mosquitos by building Imagine No Malaria kits. Each donation of ten dollars got one kit for the children to assemble. The kits included a pipe-cleaner mosquito to be put together, some other resources, and a paper cutout of a person. 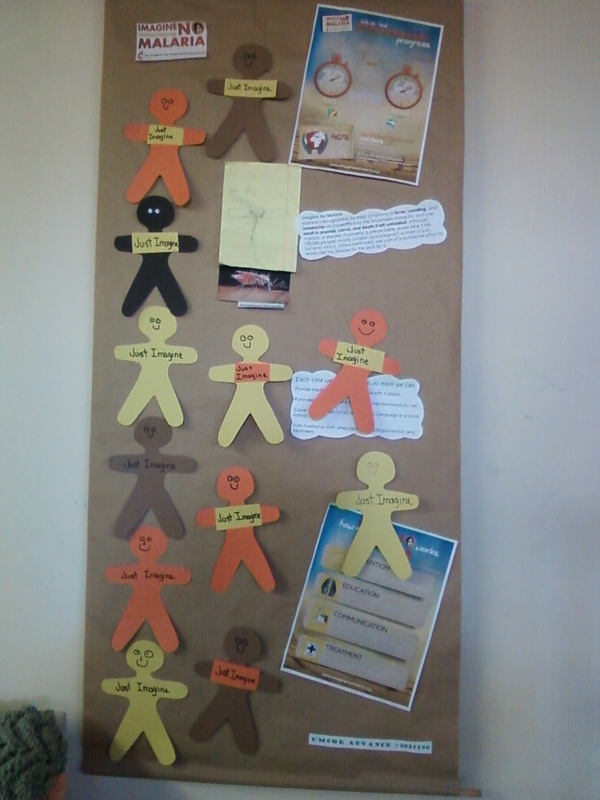 The paper people were placed on a poster as a visual representation of how many lives had been saved. In addition to the mosquito kits, Bradley UMC also keeps an Imagine No Malaria donation jar on their back altar, and donates proceeds from their suppers as well. The children love doing their part to eradicate malaria. Bradley UMC's youngest parishioner even wrote a note to the pastor: "Dear Pastor Cathy, We had the best time squashing those mosquitos". Imagine No Malaria New England Shout Outs! Willard and Joyce Robinson and Ballardvale UMC, Andover MA for raising $600 and saving 60 lives in honor of their 60th Wedding Anniversary! Lidstone UMC in Washburn Maine crossed the $500 mark in fundraising this fall. We set up a white elephant table in conjunction with the UMW Christmas Craft sale and also sold Christmas balls decked out in netting and handed out info on INM. Our butterfly nets at the front of the church have raised $162 in spare change from our wonderful congregation and on December 7th at our first ever Advent festival we plan to invite area elementary children to make Christmas crafts and INM mosquitos while giving them some info on what they can do to help. First UMC, Stafford Springs, CT for their Imagine No Malaria emphasis, including weekly visits from Rita Mosquita during Children's Moments, word puzzles about Malaria, mosquito games to get rid of those lethal bugs, and a testimonal from malaria survivor (as 9 year old child of missionary family). One 5 year old parishioner said, "I believe in Jesus and I want to give half my money (in his piggy bank) to help save the lives of the children in Africa." All the children were proud to bring in their money for this cause. Ambassador Kristine Anderson has engaged people at UMass Boston, the Dedham Farmers Market, and at Bentley College by sharing information about INM. 'Hearing their stories of surviving malaria themselves or their family members surviving malaria has been a Blessing. I look forward to reaching out to others in the community and in our local churches." Read Sarah's story (DOC) shared with Kristine by a Bentley student. October 9, 2013 — Emily (not her real name), a Colorado fifth-grader, was looking forward to how she would spend her birthday money – that is, until she was inspired to do something that would prompt her entire church to give extravagantly. Up until recently, Emily had about $300 in the bank. A hundred of those precious dollars was a gift from her grandparents on her 11th birthday. She had lots plans for that big bill—new clothes, music for her IPod and an international Barbie doll. Then something happened that changed her spending priorities – and saved thousands of lives. Have a story about from your church regarding the Imagine No Malaria campaign?